Early voting started this week in Georgia. Turnout decides elections. If you go ahead and vote now, at the Board of Elections, 2808 N. Oak St., Valdosta, you won’t have to worry about precincts or lines on Election Day! After you vote for candidates for office, you will also find on the ballot referendums for five constitutional amendments and two laws. Below the image are recommendations from the Lowndes County Democratic Committee (LCDC), which met October 1, 2018. Page 2 of Sample Ballot from Georgia My Voter Page. Constitutional Amendment 1: LCDC recommends Yes. Creates a land conservation trust fund with 0.75 percent of revenue from sales and use taxes on outdoor recreation equipment. This entry was posted in Education, Elections, Environment and tagged amendment, business, Chair, constitutional, court, Education, Elections, Environment, forest, Georgia, Gretchen Quarterman, initiatives, J.D. 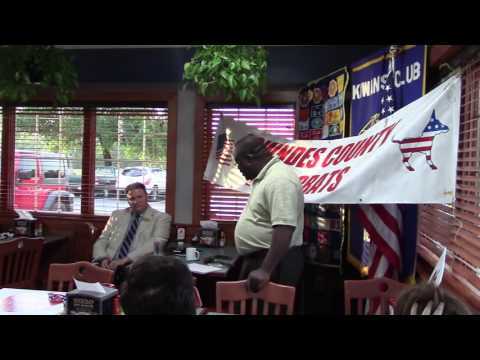 Rice, judges, judicial, Law, LCDC, LCDP, Lowndes County, Lowndes County Democratic Committee, Lowndes County Democratic Party, mentally disabled, non-profit housing, property class, property tax, recreation, sales tax, students, taxes, timberland, Valdosta on October 17, 2018 by lowndesdems. A much larger crowd this year than the previous two years listened to Democratic candidates for local and most state offices, as well as for Congress, at the annual LCDP BBQ at Mathis Auditorium, July 2, 2018, as you can see in these videos. The Lowndes County Democratic Party is about candidates and voting. There’s an election going on, so it’s time to pick a candidate and support them, and get yourself and others out to vote. This entry was posted in Candidates, Congress, Education, Elections, GA Legislature, Lowndes County Board of Commissioners, Meetings and tagged Aaron Strickland, barbecue, Candidates, Chair, Congress, Demarcus Marshall, Dennis Marks, Dexter Sharper, Education, elected officials, Elections, GA Legislature, Georgia, Georgia House of Representatives, Glenn Ritchie, Gretchen Quarterman, J.D. Rice, James LaPlant, Jim Parker, LCDP, Lowndes County, Lowndes County Board of Commissioners, Lowndes County Board of Education, Lowndes County Commission, Lowndes County Democratic Party, Lowndes County School Board, Meeting, Meetings, Nerma Dave, PR, Richard Saeger, State School Superintendent, U.S. Congress, Valdosta, Viviann Miller-Cody on July 21, 2018 by John Quarterman. Tuesday is Special Election Day to put Democrat Dr. Treva Gear in the Georgia Statehouse. Where: Go to Georgia My Voter Page. For Lowndes County, see also precincts. What: Turnout will determine This election, so get out and vote. Take your friends with you. If you don’t live in GA 175, make sure your friends that do live there go to vote. Rides: If you need a ride to the polls, in Lowndes County call the LCDP office, 229-241-1694. 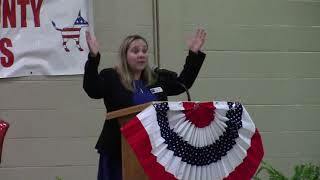 In Thomas County, call TCDP, 816-786-8561. Dr. Treva Gear, a teacher’s teacher, a recent Lowndes High School Teacher of the Year, and a military veteran, is the one Democrat running in the Special Election for Georgia House District 175. She is from Cook County, works in Lowndes County, and lives in Brooks County. For more about the candidate, see https://trevagear.com/Meet-Treva/. Some national coverage! Melissa Walker, Teen Vogue, Feb 9, 2018, Special Elections Will Be Held in Minnesota, Georgia, Oklahoma, and Florida: Here’s what you need to know. Dr. Gear spoke to the Lowndes County Democratic Party about education, jobs, public transit to get people to school and jobs, and in Q&A about the school to prison pipeline. This entry was posted in Economy, Education, Elections, Transportation and tagged 2018-01-08, 3286 Inner Perimeter Road, Brooks County, candidate, Chair, Community, Dennis Marks (Vice-Chair / Elections), District 175, Economy, Education, Elections, Georgia, Georgia House of Representatives, Gretchen Quarterman, Gretchen Quarterman (Secretary), J.D. Rice, J.D. Rice (Chair), LCDP, Lowndes County, Lowndes County Democratic Party, Mama June's, Monthly Meeting, Politics, Qualifying, recruitment, teacher, training, transportation, Treva Gear, Valdosta, volunteer on February 12, 2018 by lowndesdems. Update 2018-03-05: Treva Gear qualified Monday, March 5, 2018 to run again for District 175 in the November 2018 General Election. 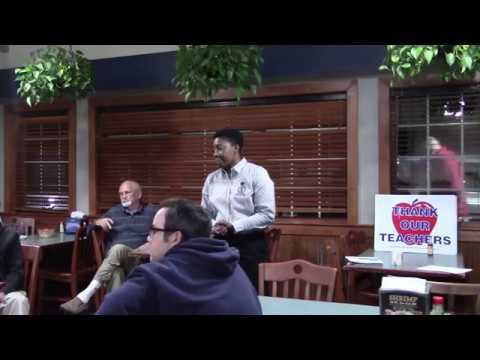 The day before Dr. Treva Gear qualified as the one Democrat running in the Special Election for Georgia House District 175, she spoke to the Lowndes County Democratic Party about education, jobs, public transit to get people to school and jobs, and in Q&A about the school to prison pipeline. The next LCDP meeting will be phonebanking for her and other Democratic candidates at the party office, 1008 Slater Street, Valdosta, GA, 6PM Monday, February 5, 2018. This entry was posted in Economy, Education, Elections, Transportation and tagged 2018-01-08, 3286 Inner Perimeter Road, Amy Carter, Brooks County, candidate, Chair, Community, Dennis Marks (Vice-Chair / Elections), District 175, Economy, Education, Elections, Georgia, Georgia House of Representatives, Gretchen Quarterman, Gretchen Quarterman (Secretary), J.D. Rice, J.D. Rice (Chair), LCDP, Lowndes County, Lowndes County Democratic Party, Mama June's, Monthly Meeting, Politics, Qualifying, recruitment, teacher, training, transportation, Treva Gear, Valdosta, volunteer on January 19, 2018 by lowndesdems. Democrat and teacher Treva Gear says she is running in the special election for Georgia Statehouse District 175. Treva Gear is from Adel in Cook County, works in Valdosta at Lowndes High School, and lives in Brooks County. Her website should be the most up to date and accurate place for information about her campaign. This entry was posted in Economy, Education, Elections, Transportation and tagged Amy Carter, Brooks County, Chair, District 175, Economy, Education, Elections, Georgia, Georgia House of Representatives, Gretchen Quarterman, J.D. Rice, LCDP, Lowndes County, Lowndes County Democratic Party, teacher, transportation, Tyra Gear, Valdosta on January 9, 2018 by lowndesdems. The Lowndes County Democratic Party is a strong advocate for a public transportation system in Lowndes County. At our May, 2017, meeting, we hosted Corey Hull, of the Valdosta-Lowndes Metroplitan Planning Organization (VLMPO) and person most responsible for doing the legwork to move this issue forward. Things are slowly moving forward, but it still needs citizen support and input to our local politicians that have the ultimate say whether or not we will have public transportation in Lowndes County. This entry was posted in Education, Elections, Transportation and tagged Chair, Corey Hull, Education, Elections, Georgia, Gretchen Quarterman, J.D. Rice, Jim Parker, LCDP, Lowndes County, Lowndes County Democratic Party, Pipeline, plan, platform, SGRC, solar, Southern Georgia Regional Commission, transportation, Valdosta on July 24, 2017 by Jim Parker. VALDOSTA — Food, fellowship and festivities are on the agenda for th[e] Lowndes County Democratic Party meeting this week. The event will be held at 6 p.m. Thursday, July 6, at Mathis Municipal Auditorium, 2300 N. Ashley St., according to an organizational press release. Tickets are $25 each and may be purchased from any Lowndes County Democratic Party committee member or at the door. This entry was posted in ACA, Candidates, Economy, Education, Elections, Environment, Health Care, Meetings, Pipeline, Solar, Transportation and tagged Affordable Care Act, Barack Obama, barbecue, BBQ, Chair, Claudia Collier, Democratic Party of Georgia, DPG, Education, FDR, Franklin Delano Roosevelt, Georgia, Greening Georgia, Gretchen Quarterman, Health Care, J.D. Rice, LBJ, LCDP, Lowndes County, Lowndes County Democratic Party, Lyndon Baines Johnson, Medicaid, Medicare, Miller BBQ, Pipeline, PR, Sabal Trail, Sarah Todd, Social Security, solar, South Georgia Medical Center, Teachers, Thank Our Teachers, transportation, Valdosta, Valdosta Daily Times, VDT on July 4, 2017 by lowndesdems. J.D. Rice came to his first meeting as new Lowndes County Democratic party chair ready to go, back in December 2016. This entry was posted in Economy, Education, Elections, Environment, Ethics, Health Care and tagged Chair, J.D. Rice on May 18, 2017 by Michael Sanger. This entry was posted in Education and tagged Chair, Education, Georgia, Gretchen Quarterman, J.D. Rice, LCDP, Lowndes County, Lowndes County Democratic Party, Teachers, Thank, Valdosta on May 1, 2017 by lowndesdems. The next monthly LCDP meeting is 6PM Today, Monday May 1, 2017. Here is video of the previous meeting. 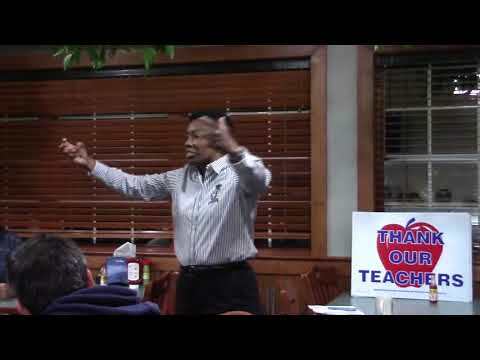 The “Thank Our Teachers” signs were first available at the April monthly meeting, as approved by the Lowndes County Democratic Committee (LCDC) at the end of March. The LCDC (essentially the board of directors for the LCDP) also formalized subcommittees on Education, Environment, Public Relations, and Finance, which were also discussed at the April meeting, as you can see in this video. And the LCDC approved a new resolution against the Sabal Trail fracked methane pipeline and for solar power which was handed out at the April meeting. This entry was posted in Education, Elections, Transportation and tagged Chair, Education, Elections, Georgia, Gretchen Quarterman, J.D. 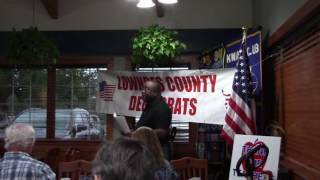 Rice, LCDP, Lowndes County, Lowndes County Democratic Party, Pipeline, plan, platform, solar, transportation, Valdosta on May 1, 2017 by lowndesdems.